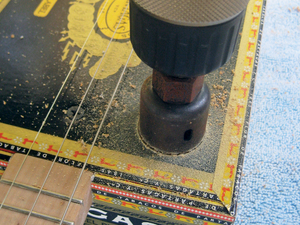 If you want to play your instrument acoustically then you will need to create a soundhole in the lid. You can be creative here by drilling multiple small holes to form a pattern, cut out a defined shape using a fret saw, or simply use a hole saw to drill one round hole in the lid. The hole or combination of holes should be no bigger than a 25mm circular hole.